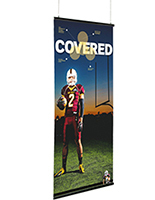 Need an economical advertising fixture that has a sleek look? 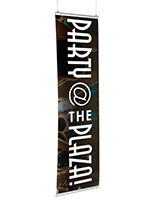 These poster hanging rails have an aluminum extrusion construction and an affordable price. Each display has a silver satin finish that complements any interior with its professional appearance. 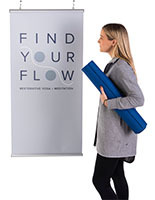 With their neutral color, the poster hanging rails are great for stores, restaurants, offices, service organizations and any other venue. The hanger can be suspended from the ceiling with chain or nylon line hanging kits that are sold separately. Alternatively, some models include suction cups for attaching the sign rails to windows. However, every frame allows two prints to be hung back-to-back, showcasing to both sides. 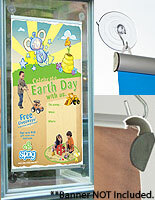 Utilizing an easy-to-use clip open design, the poster hanging rails allow for graphics to be changed quickly. Setting up the signage for hooks is easy and allows the user to switch prints on the fly for any occasion. 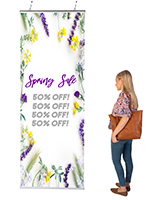 A poster hanging rail, also known as a quick-change banner hanger, is a versatile solution for merchandising. 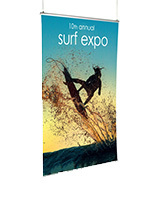 A versatile display can hold many types of print including card stock, paper, vinyl and banner media. 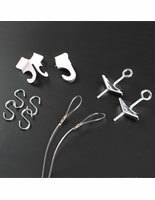 The quick-change banner hanger top attaches to the supporting chain, line or suction cup hook with an adjustable eyelet clip. This silver upper frame features a spring-loaded mechanism for keep the holder shut. 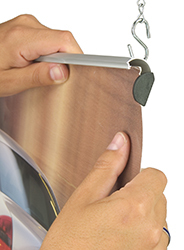 A layer of rubber creates friction to prevent the graphic from slipping, creating a secure grip. 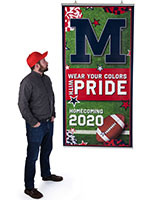 An aluminum extrusion bottom keeps the graphic straight and prevents it from wrinkling or curling. Models with suction cups allow the lower frame to be attached to the window to fasten the signage on all four corners. 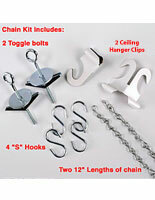 The silver hanging rails with hooks are unique because they allow for any height of graphic as long as it does not reach the floor. 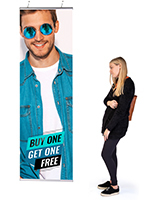 This means that prints must only fit the width requirement to be displayed properly. 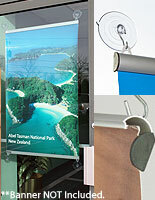 A poster snap holder for windows is ideal for any size area because of the fixture’s variable height. 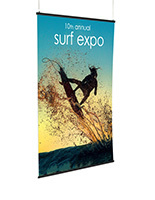 The many width sizes of the aluminum extrusion model make the quick-change banner hanger suitable for any location. The hanging rails are capable of holding a graphic of any height and is only limited by the dimensions of the room it’s placed in. 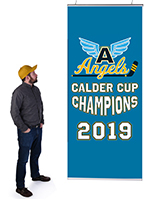 A quick-change banner hanger can be used in buildings with high ceilings to feature large prints for maximum signage space and visibility. 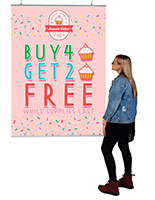 However, the silver poster snap holder is also ideal for smaller areas and can display shorter inserts in a landscape orientation. Aluminum extrusion sign rails with hooks are excellent for advertising at eye-level and are made to be flexible. A hanging fixture is great for sales, offers, events and other temporary information because of its stress-free opening design. On the other hand, the durable metal units will showcase permanent advertising for long periods of time with its durable construction. Adaptable hanging rails like these will meet any merchandising need.